Planners are one thing that keep me from losing my mind during the school year. Here are some planners I have tried out and here is how I organized my planner freshman year. I really need to take my own advice on this one. I catch myself staying up until 2 am some nights doing homework and then I'm exhausted and can't keep my eyes open the next day at school. Organization is another thing that helps me stay sane during the school year. I'm that girl in school who has her school map color coordinated to my class schedule and my folders for each class. Make sure everything has a place and everything is in that place so that it's easy to find and everything is stress free. I love the feeling of being one of the only students in the class to turn in a project or essay before the due date and it takes so much weight off your shoulders. 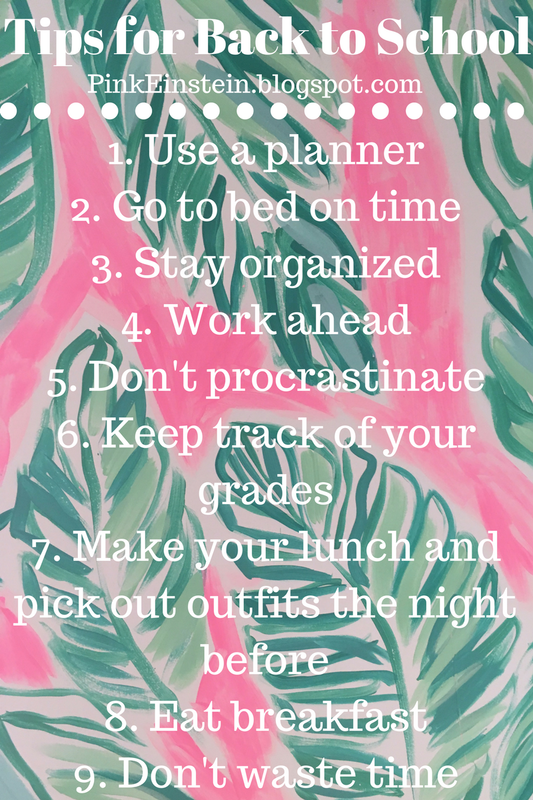 When you work ahead you don't have to worry about missing fun things friends plan or getting swamped with other homework. This ties into the tip above, get things done on time and don't wait until the last minute. Pacing yourself and getting things done will alleviate stress. I don't know what I did before I discovered that our grade book had an app in middle school. My school has an app to check grades and I check them in every class, no joke. It helps me to compare my grades to the ones written on the assignment and to help me stay on track to get the grade I want at the end of the semester. I started doing this last year and it made the early mornings so much easier! I typically pick out two outfits, the one I actually want to wear and one that is a tee shirt and jeans in case I wake up late, it rains, or I'm too lazy to actually get ready. I also make my lunch so I can just grab it as I'm going out the door the next morning. Breakfast is the most important meal of the day and it definitely helps with your ability to learn and focus at school. If you're someone who doesn't like a big breakfast put a granola bar in your bag or eat some fruit (my favorite is bananas). Turn your phone off, go to a quiet area and get everything that you need done done. You're really going to hate yourself when it gets to be 11 pm and you realize you wasted your time and didn't get your homework done. 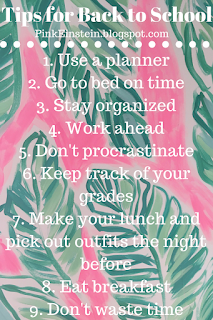 I hope these tips are helpful as you are going back to school in the next couple of months! When is your first day of school? Comment below!